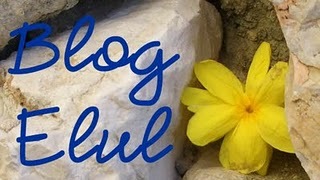 for this Blog Elul badge. Let us appreciate the light in our lives and thank God for it every day, especially at the beginning of every year, for that is when the sun and the moon finish their yearly cycles and start all over again. And when we do, too. I'm going back to work (for at least part of the day) on Monday. Tonight, for the first time in seven weeks, I'm going to sleep on my stomach. Even the wound is healing--oh-so slowly. It's a bit smaller than it was two weeks ago, and more and more granulation is visible almost daily. I’m feeling grateful for this progress, thankful for the tremendous care, concern and support I’ve received along the way, and more ready than ever to turn the page and continue this journey in 5772.